A federal appeals court ruled Friday that Peabody Western Coal Co. can give preference to Navajo tribal members when making hiring decisions for mines on the Navajo Nation. Federal officials on Thursday gave the Tohono O’odham Nation final permission to make land it owns near Glendale part of the reservation, a crucial step toward the tribe’s plans to build a casino there. Arizona saw a $27 million drop in spending at its national parks during October’s partial federal government shutdown, with $17 million in losses at Grand Canyon National Park alone, according to a new report. Gov. Jan Brewer announced that Arizona will use state funds to keep Grand Canyon National Park open for an additional nine days if the federal shutdown persists. 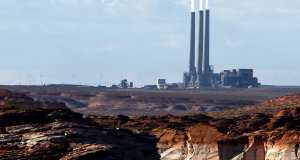 The Navajo Nation has reached an agreement in extending a lease for a coal-power plant that would give the tribe a substantial boost in annual payments. Former Arizona Gov. Bruce Babbitt called for more active land preservation by the federal government Tuesday, criticizing what he called Washington’s neglect of public lands. For the second time in less than two weeks, a Tucson-based conversation group has sued the federal government over its handling of the Mexican gray wolf. Federal, tribal and legal officials agreed Thursday that all sides would be better off if they worked to settle water-rights claims rather than continuing to litigate them.